How does Excel update all those cells? A large Excel model might have several hundred thousand cells with formulas in it. Maybe even several million. Most of these formulas will reference other cells, and many of those cells will have formulas in them that reference other cells in turn, and so on. If a formula in a Cell A2 refers directly to Cell A1, then A2 said to be directly dependent on A1. Obviously if A1 changes, we need those changes to flow through to A2. And when recalculating the entire workbook, we need A2 to be recalculated AFTER A1 has been recalculated. That’s called a dependency chain. Large models can have a number of very long dependency chains comprising of hundreds of thousands of cells that run across worksheets or even between workbooks. To keep track of how all these cells interrelate – and to ensure that a change in any specific cell’s value correctly flows through to any other cells that may depend on it – Excel builds and maintains what is known as a ‘dependency tree’. Think of this as a big flow-chart or circuit diagram showing how all the cells in one of these giant formulas interconnect. Excel maintains this dependency tree every time you make a change to a formula in a cell, by looking at the argument list of each separate function within that formula. And this dependency tree is saved along with the file itself. Thanks to this dependency tree, when you change the value in one cell, Excel can work out what other cells might be affected. And so Excel can smartly recalculate just those particular cells. Meaning it doesn’t have to blindly recalculate the whole workbook just because one fairly insignificant part of it might have changed. So let’s say you change the value of a cell somewhere that has only one other cell pointing at it (and no further cells depend on that other cell). Thanks to smart recalculation, Excel only recalculates the value of the cell you just changed, and the value of that ONE dependent cell. It doesn’t have to recalculate the entire workbook. Likewise, if you change the value of a cell somewhere that has many, many cells downstream, then Excel of course has to recalculate all of the cells further down that particular chain. But it can safely ignore any cells further up that particular dependency chain. And it can ignore any cells elsewhere that aren’t in this particular dependency chain. If a long-enough part of a dependency chain gets recalculated, then you might well see the word ‘calculating’ in the status bar while Excel works its way through all the relevant cells in that chain. But usually, this recalculation happens so fast that the word ‘calculating’ flicks on and off so quickly that you don’t notice it. Now here’s the important bit: a particular class of formulas called volatile formulas get automatically recalculated any time you enter data anywhere in any open workbook – even if the thing you just changed had nothing to do with those volatile functions. And then this triggers Excel to then recalculate all directly dependent cells downstream from those volatile formulas too. Yikes! This mean that if you’ve opened a very large spreadsheet model with volatile functions in it – and if those volatile functions have a large number of formulas downstream (or a smaller amount of resource intensive formulas) – then if you are say trying to add items to a shopping list that you’ve started in another workbook it could take minutes for you to add each item to that shopping list, because every time you add an item, it triggers an avalanche of unnecessary and pointless recalculation in the large spreadsheet model. The fact that each and every cell ‘downstream’ of any volatile formulas get recalculated is an important point to get your head around. Many people think that slow calculation times due to volatility is due to the time it takes to recalculate large amounts of volatile functions in a model. But often most of that delay is in fact due to the recalculation of all the cells ‘downstream’ from those volatile functions. In other words, even just one volatile formula with a very long calculation chain hanging off it could cause you grief. And if that calculation chain gets more and more complex, so does the effect of that one volatile formula. (And what the heck…if you enjoyed that, then click this link too. But hurry back…this post is getting cold). So which functions are Volatile? Many large models make use of the TODAY() function to check if a date entered by a user occurs in the past, present, or future. Most of the spreadsheets you use these functions in are so small that you probably don’t even notice any extra volatility-related recalculation. So no harm done. However, if you’ve ever had that a large spreadsheet that seems particularly sluggish when you’re trying to enter new data – or that seems to impact the performance of other open workbooks – then chances are you know exactly what I mean. I’ve seen frustrated-looking users waiting for as long as one to two minutes for particularly large models to recalculate after each and every change they make to it, even if those changes are relatively insignificant, such as changing the spelling of a column header. Often spreadsheets like this get so sluggish that users switch Excel’s calculation setting to Manual, just so they can make changes in a timely fashion, and then switch it on again when they’re done in order to have the model calculate the correct answer. This is dangerous…I’d never set calculation to manual if I could help it. There’s just too much chance that someone someday will use output of such a model without remembering to set calculation to Auto. What’s worse, when you open two workbooks, one saved in manual mode and one saved in automatic mode, they will both have the calculation mode of the first workbook opened. I have seen many cases in my career where analysts have done just that…opened a workbook with calc set to manual, opened a whole bunch of others where calc was set to auto, and then done an entire day’s work without realizing that calculation was subsequently turned off for all of them. Doh! Previously you might have thought that you had no choice but to switch calculation to Manual, because you might have thought that this sluggishness is an unavoidable consequence of the size and complexity of your spreadsheet. But now you know that it *might* be caused by use of volatile functions, and that volatile functions might not be suitable for some occasions…particularly if you’re building large models that utilize these functions at key points within your model. Replace those Volatile functions with some non-Volatile alternatives, and you’ll likely find that your model stops being a slow dog, and starts being a much faster greyhound. To the point that you can switch calculation back to Automatic again. What are the alternatives to Volatile functions? While volatile functions like OFFSET() and INDIRECT() are incredibly useful, you can usually achieve the same thing by using other non-volatile formulas such as INDEX or CHOOSE, as well as through leveraging off the dynamic references that Excel Tables allow. And instead of the TODAY() function, you can use VBA to populate today’s date as a hard-coded value in big models, as you’ll see in the download file below. Check out the Alternative Functions tab of that file to see some examples of common use of volatile functions, as well as some non-volatile alternatives. 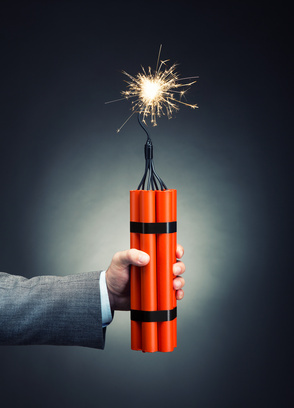 If you’re struggling to find a non-volatile replacement for an existing volatile formula, then you can always post a question on the Chandoo Forum asking for some advice on non-volatile alternatives. Am I being over-zealous here? As we’ve seen, too much reliance on volatile functions *might* trigger large parts of a model to be recalculated needlessly. But it’s worth remembering that this is only going to be noticeable in particularly big spreadsheets. So perhaps I’m being a little overzealous here. So if you know what you’re doing, then maybe you don’t want to dismiss volatile functions outright. After all, you can always assess your options on a case by case basis: try them out, test, test, test, test again, and then make a balanced decision. However, if you know of an alternative formula combination that does exactly the same thing as a volatile formula, then I’d suggest that you get into the habit of using that instead whenever you can. That way you won’t inadvertently have issues when it really matters. And I’d suggest that if you don’t have much experience of functions and performance, then perhaps it’s safest to simply err on the side of caution and steer clear of volatile functions altogether. So not only do I see little down side to avoiding volatile formulas, but I see a significant upside: I’ve seen plenty of large models built by the likes of the big 4 accounting/consulting firms that make heavy use of volatile functions, and that consequently have recalculation times so long that they are effectively unusable. Stripping out the volatile formulas from these models has resulted in delays from data entry falling from upwards of two minutes to well under a second. Not to mention that users can now work on other files while these models are open, without fear of triggering an avalanche of unnecessary and pointless recalculation. Had these model builders known to avoid volatile functions, they would have saved users a lot of grief. In fact, on Charles’ website he goes so far as to say avoid volatile functions wherever possible. With all that in mind, I’ve made a personal choice to steer clear of volatile functions where I can. Your mileage may differ. Regardless, the subject of volatility is definitely something that intermediate users should be made aware of. What they do with that awareness is up to them. But forewarned is forearmed. 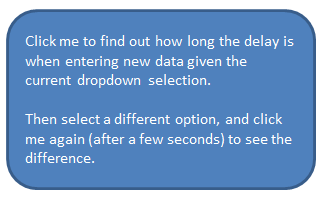 If you choose the Use Volatile TODAY() Function option from the dropdown, then whenever you enter data in that 3rd ‘Completely independent cells’ column then you should notice a significant delay. Change that dropdown to ‘Use Hard-Coded Date’ and you should experience significantly less delay, if any. Why are some functions volatile? NOW() should always return the time as at the last calculation, so needs to be refreshed any time new data is put into the workbook, in case one of your formulas does something specific based on the time of day. Indirect Returns the reference specified by a text string. References are immediately evaluated to display their contents. So Indirect(“$A1”) tells Excel “Go look in cell $A$1, and tell me what’s in it”. So why would that mean they need to be volatile? Because Excel constructs dependency trees based on cell references. INDIRECT() has an argument that is constructed out of text – e.g. INDIRECT( “$A1”). This might look like a cell reference, but it is not. In fact, the argument of an INDIRECT function might equally look something like this: INDIRECT(“$B”&$C$9-2). OFFSET() takes numerical arguments, which point to a cell reference, but are still just numbers. In order for these to form part of Excel’s dependency tree, the Excel dependency tree algorithm would have to first evaluate text like INDIRECT( “$A1”) or the numerical arguments like OFFSET($A$1,1,2,5,3) in order to determine what the associated cell reference actually is, before adding it to the dependency tree. Maybe the Excel obviously made the call that rather than introduce this extra step where these two functions are concerned, they may as well just make both functions fully volatile. But given that you can set up INDEX() do much the same thing as OFFSET(), why doesn’t INDEX need to be volatile too? I imagine it’s because INDEX uses range arguments, whereas OFFSET uses numerical arguments. So Excel can extract these range arguments directly from an INDEX() function when building/amending the calculation dependency tree. Note that INDEX() is what’s called semi-volatile, meaning it gets recalculated when the workbook opens. And also note that any formulas used in conditional formatting effectively become what Charles Williams calls super-volatile: they are evaluated each time the cell that contains them is repainted on the screen (which happens say if you use the scroll bar to move the ‘view’ up/down or left/right), even in Manual calculation mode. But because no other formulas are ‘downstream’ from conditional formats, then only the conditional format formulas themselves get recalculated. So if you’ve got simple conditional formatting rules, you won’t notice any delay. I’ll talk about alternatives to using volatile functions in a series of upcoming posts. But meanwhile…if you’re not feeling too sluggish…then check out these great links from Excel MVP Charles Williams. Pretty much everything I’ve covered in this post came from Charles’ writings, so I’d like to acknowledge the work he has done in explaining this complex subject to countless Excel users over the years. Charles also sells a great add-in called FastExcel for profiling Excel calculation performance and memory useage – so be sure to check that out if you want to get serious about diagnosing volatility issues with your own Excel models. You may also be interested in Jan Karel Pieterse’s RefTreeAnalyser utility, which among other things allows for easy Auditing of formula dependents and precedents, helps you trace errors, and will let you time your workbook calculation for each worksheet to find bottlenecks as well as check columns for formula inconsistencies. Jan Karel has a free demo version with limited functionality, if you’d like to take it for a spin. This has been a particularly taxing post to write. So if you found this article helpful, please let me know below in the comments. If you’re not following something I said, or can think of a better way to say it, then let me know that too. Depending on what you want to do, you may like to consider the reference version of INDEX(), or the CHOOSE() function. See my response below in reply to Perri. Thanks for this. I'd never heard of the dependency tree and smart recalculation. This helps me understand a lot. Also, thanks for the warning against setting calc to manual. One request that I have is for an explanation of nonvolatile functions that cause Excel to drag. I've never used any of the volatile functions in such volume that they hurt performance. But I've seen thousands of SUMIFS and VLOOKUP slow and even crash Excel. How are they different from other functions like OR, INDEX, CHOOSE and IFERROR? Great article Jeff! I am a habitual user of OFFSET (I'm trying to overcome my addiction) with named ranges to make them automatically resize. As you continue your series, I'd be interested in hearing how you handle those situations efficiently. Chris: if you're using Excel 2007 or later, use Excel Tables. You may never need create dynamic named ranges again, because Excel Tables are dynamic named ranges. Bullet-proof ones at that! Thanks for taking the time to provide me with those excellent links Jeff! Thanks for the article also Tables are a great tool for formatting as well as calculating. However, I have the feeling that these are unfortunately somehow volatile? I am working on a small Excel file (14 tabs, one table on each). And despite avoiding the use of OFFSET/INDIRECT, and working on manual calculation (sorry for this T_T) every time I add a row and use a filter Excel got frozen for 10 to 15 seconds. Am I doing something wrong? Sorry but the file contains private data. I will look forward with the line management to see if I can send one with random data instead. However I deleted external links and it didn't change much about it. It also seems quite random: once I waited 30 seconds to see all data from a filtered table, when I did it again right after it was instantaneous, adding rows in a table seems fine but deleting them takes 10 seconds. Thanks for this. I use Indirect quite often when I build dashboards. It enables me to look up value on different tabs based on the selection. What will be an alternative to indirect? I'll be covering this in a future (as yet unwritten) article. For instance, say we have three named ranges: Sales, Forecast, and Variance. And lay we have a picklist in cell A1 where a user can choose either ‘Sales’ or ‘Forecast’ or ‘Variance’. And in A2 we have an IF or VLOOKUP or even CHOOSE function that returns 1 if the user selects Sales, 2 for Forecast, and 3 for Variance. …which dynamically returns the sum of the range that the user selects with the picklist. =SUM(CHOOSE(A2,Sales, Forecast,Variance)) as the CHOOSE function also accepts ranges. So the CHOOSE function can be better at this than INDEX, because it doesn’t care if your data ranges are on different sheets or even in the same workbook. Whereas try to point index to multiple ranges on different sheets and you will get an error. Thanks for this interesting intro to optimizing. You give us a list of functions to not use, or use carefully. It would help if in this article you would also include alternatives to the functions. I saw a couple, like hard code dates instead of =Today(), but I would appreciate it if you provided more emphasis on these alternatives. I understand that you can't go into detail about everything, but at least knowing immediately what the alternative is allows us to do our own research until you can write the rest of the articles in this series. Ron: as per my article above, if you’re struggling to find a non-volatile replacement for an existing volatile formula, then you can always post a question on the Chandoo Forum asking for some advice on non-volatile alternatives, and you can check out the Alternative Functions tab of the example download file to see some examples of common use of volatile functions, as well as some non-volatile alternatives. And you can always google "Non-volatile alternative to [some function]. Your line I understand that you can’t go into detail about everything, but at least knowing immediately what the alternative is allows us to do our own research until you can write the rest of the articles in this series. made me laugh out loud...you're asking me to let you know now about what's in the other articles. The other articles aren't written yet. So I can't let you know now, because my time machine broke. Need help fixing your time machine Jeff!!! I can't stop laughing out loud in the office!!! that's hilarious!! Luv'd it, shar'd it, memoriz'd it. I didn't know this, so thank you for the explanation. You wrote: "And this dependency tree is saved along with the file itself". Is there a way with VBA to make this tree visible in a sheet? I know i could use the "blue arrows" to see the dependency but is there a way to show it as a tree or in a table? Thanks for your replies and the information. I just had a quick look at it and i think the sites contain the information i was looking for. "CHOOSE....Whereas try to point index to multiple ranges on different sheets and you will get an error." Oh, this tangent may open up a whole new world of possibilities. Awesome! Go discover, my friend. A *lot* of good stuff on this thread. I am always using an INDIRECT nested in an INDEX, with the indirect pointing to a named range to summarize elements from several larger tables. (Like INDEX(INDIRECT("Region_"&A1&"_Office_"&B1),2,1)) I imagine I can sub out CHOOSE for the INDIRECT, (I can even write a macro to do it for me,) but the resulting formula will be very large (at a minimum, 30 named ranges are being used.) Is there any way to get the speed of the CHOOSE with the dynamic features of INDIRECT? Steffan - nope. That's the down side of using CHOOSE...you've got to specifically identify all the ranges. But that's what makes it non-Volatile...because Excel can then extract those cell references and use them to amend the calculation dependency tree. Or you can use PowerPivot if installed to bring all those separate tables into one PivotTable, and then users can filter that pivottable on the region and office of choice. I went the macro route. My workbook has a dashboard driven by offset which relied upon a large table which in turn summarized the results of 30 calculators using named ranges. Each calculator used indirect() to construct the name of a named range which holds the calculator's drivers. (about 20 drivers are used in their own tables which come from SQL in one big lump, and often there would be the need to add or multiply drivers together, so there would be multiple INDIRECTs() in the calculators.) I wrote a macro to fish out the INDIRECT() clause from the formula, and then used activesheet.evaluate() to convert that clause to its static named range. I ran that against the calculators and got so much speed back that I found that i could leave the dashboard's offset formulas in place. Awesome! Another approach is that you could always use a bit of SQL to mash things up, including ranges inside the workbook itself and parameters from the workbook. Although it requires quite tricky VBA, unless you have PowerPivot installed, in which case you can do this natively. OK, that IS pretty awesome. The macro works to convert the workbooks that I already have in place, but the idea of using SQL and a "remote" connection to the same workbook to do my aggregation is pretty dang awesome and I'll try it when building new models. Thanks for putting me on that trail! 1 question: Does formulas inside arrays and vectors are also volatile? I mean, if a change 1 cell inside a array, does the others are recalculated? Thanks Matheus. Can you describe a little more a hypothetical scenario? Thanks for the heads up Jeff, this is all new information to me. I often use indirect and offset to create dynamic references/ranges based on user selection. Your article has certainly opened up my mind to explore the alternatives and how I might leverage index/choose a little differently to achieve the same result. Awesome, Mark. People with open minds make the best analysts. Index/Choose are fun functions to get to know. Enjoy. Very little detailed explanation out there on the subject of how Excel goes about calculation via dependency trees etc. Thanks very much Jeff for your clear explanation. Thanks, it is very usful post. I've learnt a lot from your websit. Very useful info on volatile functions, thanks. I frequently use offset() for dynamic named ranges in a table. This then allows me to selectively sum one column, depending on the values in another column. I don't want to use DSUM , since the selection criteria can't be encoded into a single cell. Is there any better way of achieving this, without the volatile offset()? Thanks for this. Really useful. I'm not really at the level where I usually worry about these things but am getting there. I'm just dipping my toe into the VBA world. What is the text that I would have to copy for the VBA to hard code the date into cell A1? Tried to grab it from the download but too amateur to be able to work it out. Really appreciate your article, explained a lot! My compliments on article and website. Well I have a somewhat different wish: to deliberately include a volatile function that triggers excel to calculate. Why? To mark the active row. I can do it with a macro but the undo option becomes unavailable. So I used NOW() in my conditional formatting. Doesn't work. Then I used it in a separate cell, as I thought perhaps the conditional formatting is unaffected by volatility. Also this doesn't work; I had to force it by clicking the 'Calculate now' option. How could I make this work? Or how would you go about it? Looking forward to hearing your thoughts, thanks in advance. Good written article - includes all information I was looking for. I'm just wondering, how to rewrite vlookup using non-violate functions without naming the range (not sure if I overlooked it here) - is it possible? Why don't you use index/match? Is it possible that INDIRECT will just stop working at some point or could OS or other local environmental issues affect it? I'm using INDIRECT in a summary spreadsheet and it was find last month, but not now. I do plan to rewrite, but would like to know why the thing just stopped working. Can you post a sample of the formula that isn't working ? What about data validation using tables? Will this cause the cell itself to be marked as volatile? Is there an alternative to INDIRECT? Thanks for a great, informative article. Dear Chandoo... Please answer this ..It is important to us! Hi Chip, you can use a better approach like this. Then, in the DV, use the name colors as the source of list. Wow, this is so helpful!!! So, now my question, is there a way you can find/track what is making your workbook slow? For instance, a program to run you workbook through to point out all the cumbersome spots?? I've been able to avoid these volatile functions, but sometimes my workbook still lags a ton, and i think i have a relatively small file. Chealsea: you could try fastexcel. See http://www.decisionmodels.com/fastexcel.htm for more details. I have this program myself, but can't say I've used it a lot. Maybe it's time I tried it out on someone elses worksheets. If you can share your workbook, I'd like to take a look. I might whip some code up to help users track down bottlenecks at some stage. This is a really useful guide. I've been struggling with some spreadsheets of epic proportions that go into calculation meltdown, and this has given me some good pointers, but there are a couple of things you might be able to help me clear up. (c) none of the formulae are re-run on every change, it's just the conditional formatting checks that are re-run each time? Hi Stevie. The answer is (c). Glad you found the article useful. Had udf sheet that took 10 sec converted to index from offset now instantly runs. Read lots of others but your presentation was the only one clear enough to get through my thick skull. Thank you. Hi Gable. This was a guest post from myself, not Chandoo. I'm really pleased you found it useful...I spend a lot of time writing and rewriting it for clarity, because it is a very tricky subject. This is going to be a big help, thanks. This invokes INDEX plus 2 calls to ROW. Am I better off with OFFSET? Is there a better way? Thanks for the article. It really helps in the understanding of Excel performance. A question for someone here. I have a large spreadsheet that over 1,000 formulas that compare a value to today's date. Knowing that Today() is volatile I put the =Today() function in a cell and then created a name reference to that cell. So my 1,000 formulas use the named reference instead of Today(). The questions is am I saving calculation time by doing this or is their no difference? Thank you for a very helpful ... and useful article. Have bookmarked it as a reference. When the issue comes up I've never been able to give due justice to the topic. This will save a lot of unnecessary typing at my end. I have been running a vba program for years and suddenly it was taking 17 minutes, where normally it was about 20 seconds, it's a data sorting macro. The problem turns out to be a second open workbook that I was transfering this data too, it contained the "indirect" function, and just having it open (not active) was enough to cause the problem. Have you tried a SQL or Power pivot method of accessing the data in the other file ?